If you are a UK taxpayer your donation provides extra benefit as a result of Gift Aid. See ‘How you can Help’ for more information and how to recycle inkjet cartridges, mobile phones or sell on Ebay to help tortoises! Our new full colour 24-page free guide, produced in conjunction with the Tortoise Trust, is now available. Called “Taking Care of Pet Tortoises” it covers housing, feeding and general care of the popular Mediterranean tortoises. It is now being distributed to pet shops, veterinary surgeons, rescue centres and private keepers. If you would like a copy, please email us. 1) To offer veterinary students, nurses, and those involved in wildlife rescue and rehabilitation programs in deprived areas and developing countries access to educational books, supplies, and training materials aimed at improving the standards of care and husbandry received by tortoises and turtles. 2) To provide technical, financial and material support to wildlife rescue and conservation programs, projects and centres involved with tortoises and turtles. 3) To develop and produce training materials aimed at improving the knowledge and experience of all those involved in caring for tortoises and turtles, especially those involved in handling wildlife rescues and rehabilitation. 4) To provide bursaries and funding to subsidise training and work experience for students in those wildlife management and veterinary fields where this will benefit tortoises and turtles. 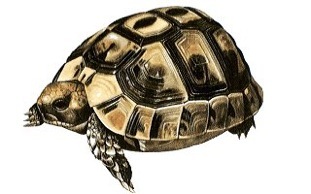 For practical help and advice on tortoises and turtles, please visit The Tortoise Trust.